Magnum Systems is an industry leader in designing and manufacturing bulk material handling equipment and custom-engineering plant-wide, integrated systems. We provide individual equipment as well as automated systems designed for both interior and exterior plant locations that handle bulk materials such as bulk powders, granules, flakes or pellets. Our equipment and systems are custom-engineered for each step in the bulk material handling process. our bulk material storage silos, bins and hoppers are designed to hold, protect and control any dry bulk material before discharge. Our pneumatic equipment is designed to transport your bulk material from point A to point B. Our conveyors and feeder are engineered for application, material and your sites requirements. discharge equipment is designed to unload material in any processing site environment. We custom build solutions to meet even the most challenging on-site limitations. our bulk material filling equipment is designed to weigh and fill multiple types of bulk containers such as FIBCs, drums, totes and boxes. Whether it’s agricultural seed or asphalt, no two material handling systems should be treated alike. Truck or rail, chemicals or feed -- the selection of equipment, parts, controls and components must be engineered as a total solution. 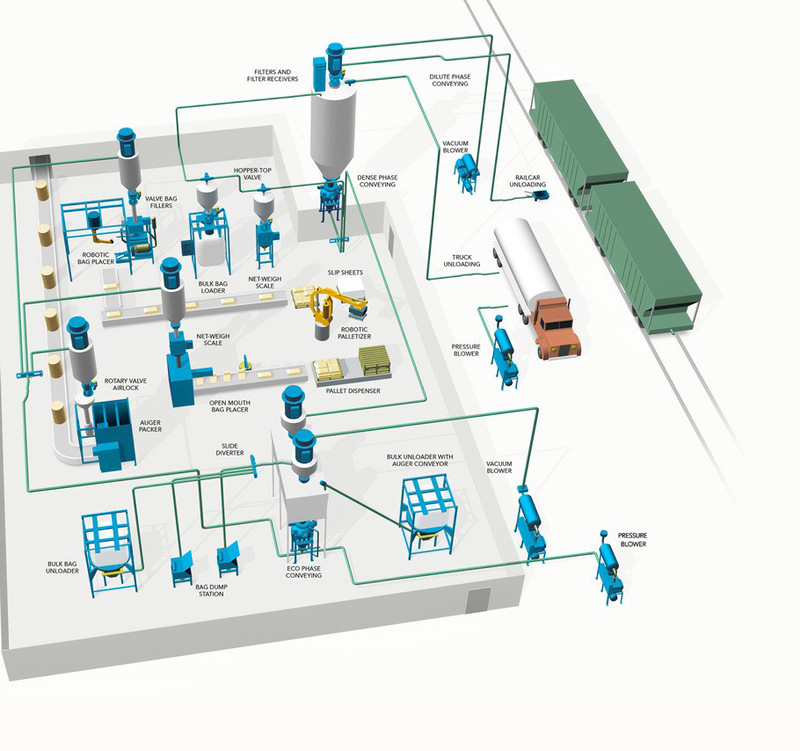 This holistic approach to material handling and packaging system design is what we do best. New plant builds. Facility upgrades. Material composition changes. Labor shortages. Fulfillment accuracies. Whatever the situation, efficiency affects your bottom line. We are experts in pneumatic conveying system design with years of experience in developing a system that’s engineered to your facility and type of material. We also have over 50 years of experience in manufacturing rotary valve airlocks. We design and manufacture packaging components and parts engineered to stand alone or in conjunction with a new or existing system.We also have long-standing relationships with some of the best automation and robotics partners in the industry, making us a single source for plant and facility automation. We look at your process as a whole and help you design a system to gain a competitive advantage -- measure by measure, beginning to end. Our customers depend on Magnum Systems to keep their line moving, before and after the sale. Sometimes our greatest moments come long after we have designed and installed a system. Learn more about hours and ordering replacement parts. Roll up your sleeves and work alongside the best in our industry. Our wide range of systems and customers offer plenty of opportunities to put your skills to the test and learn a few new ones. Our managers know great talent when they see it, and we invest in what makes Magnum Systems a leader in our field – people like you. Find out what events, trade shows, and conferences Magnum Systems will be participating in. We enjoy meeting customers, partners and vendors in person and figuring out the best solution for all involved to keep processing and packaging lines moving.